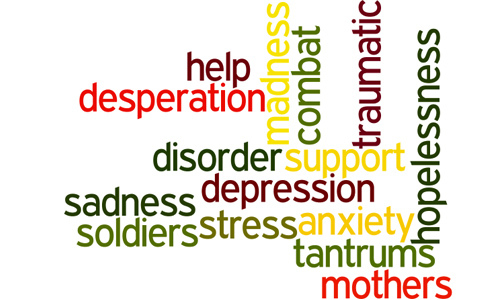 Mothers of kids with autism suffer from the same disorder which combating soldiers suffer from “Post Traumatic Stress Disorder” (PTSD). But mothers of adolescent and adult children with autism in particular suffer the most. It is understandable that living under stress and being hyper vigilant and in a state of emergency for years can take a toll on parents health, but mothers in particular. Waking up every morning not knowing how the day will go, can seriously affect the mental and physical state of people. Mothers of kids with autism spend more hours to care for their families and home than mothers with typically developed kids. They have more doctors’ and therapists’ appointments. They have to spend more time helping with homework and assigned projects. The worst is that they sometimes have to deal with temper tantrums and oppositional defiant behavior. Recovering from this kind of crisis and bringing child, home, and herself back to a functional state takes a lot of physical and mental energy. Generally speaking, mothers are more involved in caring for a child with autism than fathers. Mothers spend less time to care for themselves and become gradually isolated from the outside world. Even at work she is twice more likely to take time off from her work. Often times students with autism have to be sent home, especially those with severe autism. Many of them have gastrointestinal issues. Some of them have to go for evaluation or a dental appointment. Let alone the emergencies, like meltdowns when the child becomes self injurious or aggressive and staying at school becomes near impossible. However, there are small things that they could try to do to catch their breath and keep going on their mission. If you cannot set aside a solid one hour a day for your self to do what you love to do, break it down into small segments of time (10 or 15 minutes) through out the day. If it is impossible to set aside one hour a day, make it half an hour or even fifteen minutes. You need to connect with your inner self, no matter what. Ask for help, there is nothing wrong about it. Let people know that you need help, how would they otherwise know. Find a support group in your community. When feeling low, depressed, or desperate talk to a close friend. Sharing a problem is halving it, even if nothing has changed. If you don’t have anyone to talk to, call your local help or hot line for assistance, especially if you’re feeling suicidal. Practice deep breathing in and out very slowly. Know that once you start breathing your brain start relaxing. You are simply allowing more oxygen to your body. Try to find your eligibility for services, that you are not aware of, that may provide you with some respite. Try to plan and organize for the week ahead to maximize your efficiency and minimize stress. Working according to schedules for you and all the family members will bring more peace to the family. 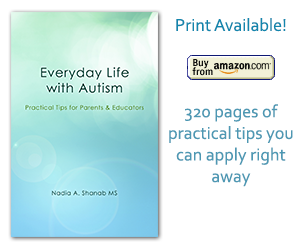 Individuals with autism need to be prepared ahead of time. During a crisis minimize talking and use visuals. Consider having a pet, a dog or a cat have can significantly reduce your child’s stress level, as well as yours. Why not seeking professional help to develop a coping mechanism? Don’t wait too long, your are your child’s most important asset.